Take advantage of this special offer at either of our Manhattan locations or send to a friend so they can experience the beauty of Salon Ziba for themselves. Please present this voucher at check-in to claim your $20 gift. Limit one per person, per visit. This gift is valid toward your first service or a salon service you have not experienced in the last 12 months, valued at $95 or more. It cannot be combined with any other promotional offer and is limited to select technicians. No cash value. Offer may be discontinued without notice, at any time. Offer is not valid with up-do or makeup services. 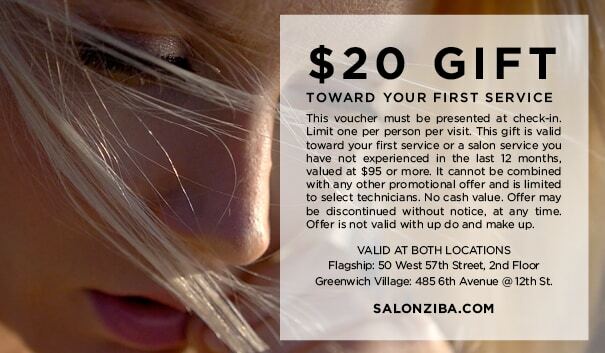 If you have any further questions, give us a call at 212-767-0577, or email us at info@salonziba.com.